Podcast 27: COCAINE AND PAINKILLERS, by David Malki ! “COCAINE AND PAINKILLERS,” by David Malki ! At nine o’clock on a Tuesday morning, the parking lot in front of Jack Bogg Enterprises was somehow already full. Kelly didn’t know quite what to do. It had never happened before, not once in the year she’d been working for JBE. Especially troubling was that her favorite spot — right by the planter, the only spot in the office park guaranteed to be in the shade at six P.M. — was taken by some cruddy old Volvo. But three circuits of the lot only served to make her late, so she sighed, pulled around to the other side of the long metal building, and reluctantly parked by the O-ring wholesaler. She doubted she’d be leaving work before sunset anyway, if the last six weeks were any indication. David Malki ! is the author, most recently, of Dispatches from Wondermark Manor: The Compleat Trilogy, a new omnibus collection of his parody Victorian novel series. Nika Harper is a gamer and video host, working at Riot Games in a job primarily consisting of encouraging all types of creativity and giving stuff away. She has a secret writing habit that she hides the best she can, especially when people ask questions like “You look tired, did you sleep last night?” Nika has been an actor, dinosaur, D&D dungeon master and her goal in life is to make people smile. In the book, “COCAINE AND PAINKILLERS” is illustrated by Jess Fink. This podcast episode was edited by Matthew Schwartz. MOD Magic & Variety Show! Here is the live stream! UPDATE: Now here is the full show in two parts, recorded for your viewing pleasure! More video clips will be posted over time. 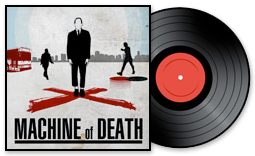 Tweet along to us using #machineofdeath. Search to see what others are saying too! 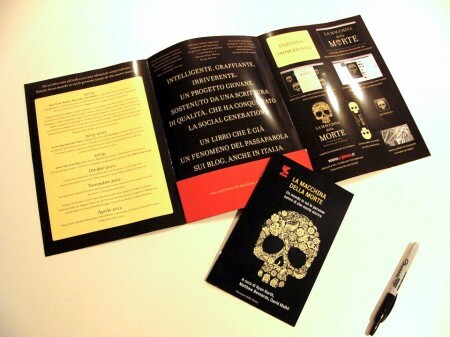 These pictures are of the press kit for the upcoming Italian version of MOD1, La Macchina della Morte! The exclamation point is not in the title of the book, that is just me being excited. The Italians are going all-out with a promotional blitz that includes custom bookmarks inserted into other books in stores, point-of-purchase ads and displays, media coverage in the Italian press, even some sort of app. It’s incredibly exciting to watch a large publisher’s promotional machine swing into action on our behalf. I hope the book does well in Italy when it comes out next year! 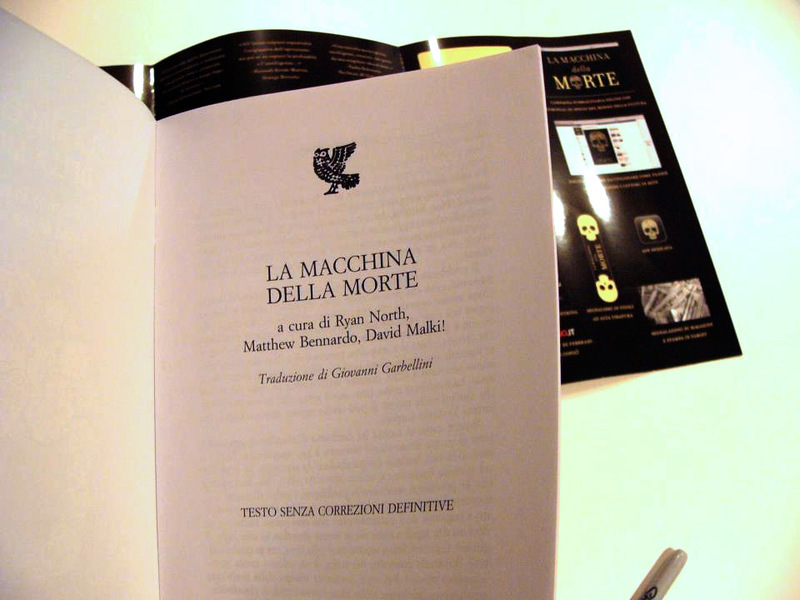 Tell all your friends in Italy to buy a copy! Oh and if you have friends in Germany, tell them to buy one too, when the German edition comes out in January. Oh and if you have friends in Spain, tell them to buy one of the Spanish versions too. If you have friends in France, you might as well tell them too. Ditto for all your friends in Croatia, Korea, Japan, and Israel. That’s right — there will be eight different foreign editions of MOD1 coming out next year across the world, and we are just pleased as punch! 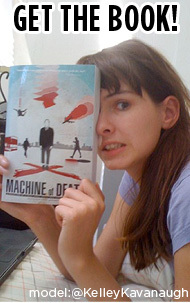 I hope all of the covers will be as cool as that flowery skull design. We’ll be reading from the Italian press kit (and doing many other things) at the Super-Stupendous Magic & Variety Show in Los Angeles this very week! It’s on Thursday night, the 17th, 8pm at the Fake Gallery in Hollywood (4319 Melrose Ave, 90004). Admission is free. Drinks and snacks will be served. I will be there in person along with MOD illustrators Kris Straub and Kevin McShane, and Ryan North will be there via Skype (for you to chat with!). We have a Facebook invite too. There’ll be magic. Music. Games. Talking — including the official public announcement of the stories that will comprise MOD2. If you can’t come, watch the livestream right here on the blog. So excited about this. I’m excited to see a magic show, sure. But just as much, I’m excited to say “I want to do something fun. What’s stopping me? I guess…NOTHING” and then I just put on a dang show. I really hope you can come be a part of it. Please contact us right away. All emails should have gone out by now. Some are bouncing back. We do what we can. Here is some demographic information on the illustrator submissions! There were 151 valid portfolio submissions in all. 85 were from men and 66 were from women, for a % split of 56/44 — it’s super great to see it be that close. for a total of 12 countries and 4 continents represented. Not bad! We will be contacting the artists we wish to hire soon. We will not be contacting the ones we don’t need for MOD2, but we will be keeping all info on file for any future projects. What of them? Thanks for your great suggestions in the comments to the last post. We’re taking all options under advisement, although we are definitely keeping MOD2 at the forefront of our attention right at the moment. We still have to edit the stories, commission the illustrations, and put the book together, which is a big job. But we are definitely carefully considering possible next steps as well. So keep the ideas coming! Tiffany showing a little team spirit. 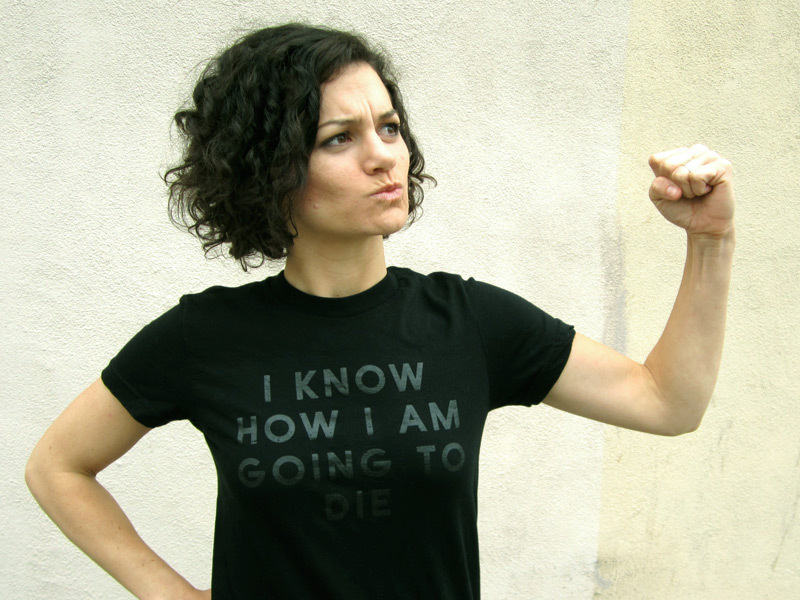 MOD apparel is available in our TopatoCo shop.